Paper: 5 7/8 x 5 1/8 in. Paper: 6 1/4 x 5 1/8 in. 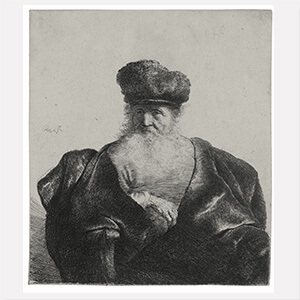 Rembrandt Harmensz. van Rijn was born in Leiden, The Netherlands, in 1606, as the son of a miller. He attended Latin School and after briefly enrolling at Leiden University, decided to become an artist. 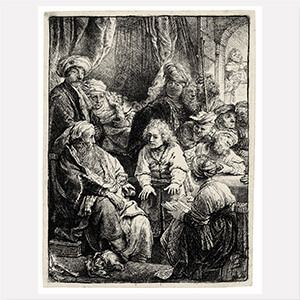 Rembrandt received his first artistic training from Jacob Isaacsz van Swanenburgh (1571-1638) in Leiden, and later became a pupil of history painter Pieter Lastman (1583-1633) in Amsterdam. By 1626 Rembrandt worked independently in Leiden alongside Jan Lievens (1607-74), another of Lastman’s students. 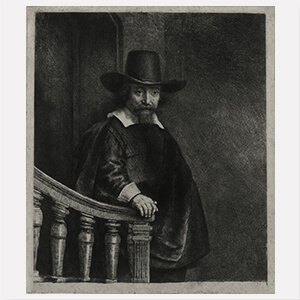 After settling in Amsterdam in 1631, Rembrandt soon became a sought-after portraitist of wealthy burghers. His financial success allowed him to maintain a large studio with numerous apprentices and acquire a stately house. In 1634, he married his fist wife Saskia, who posed for many of his works, often as a biblical figure. The couple had four children of whom only one, Titus, survived infancy. Saskia died in 1642, the year Rembrandt completed the monumental Nightwatch (Rijksmuseum, Amsterdam), one of his masterworks. 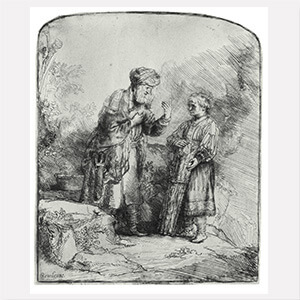 His housekeeper Hendrijke Stoffels became Rembrandt`s second life-companion. The couple never married, but had a daughter, Cornelia, together. By 1656, financial troubles caused Rembrandt to lose most of his assets. He died in 1669, pre-deceased by Henrickje and his son Titus, never regaining financial solvency. 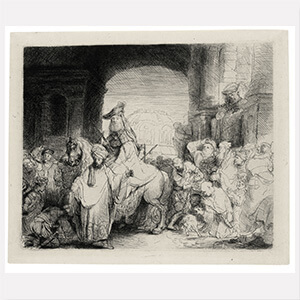 Rembrandt is most celebrated for his highly sensitive, un-idealized portraits, as well as his multifaceted depictions of religious and historical scenes. He was a master of chiaroscuro, both in his oil paintings as in his graphic works.